Our morning starts at 7:30 am. Fruit is cut for morning tea and children choose activities that they will be responsible for throughout the day from the “I did it!” book, for example, feeding the chickens, the fish or turtle, shaking hands, watering the garden, feeding the worms, the compost bin, the weather chart, setting the tables for lunch, activities to set up for outdoor play, setting up the indoor environment and others. At 9:00 am we then transition to choose individually work and independently choose an activity that each child is currently interested in. Activities are attractive and they can be done individually, in small groups with or without an adult. 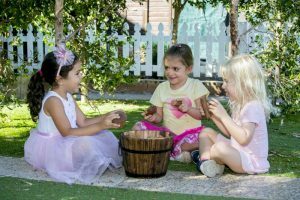 Playing games, reading stories, singing songs and playing music are all part of the morning with as much uninterrupted time for children to explore, discover and engage in a range of interesting activities. This cycle continues until lunchtime at 12:00pm when we go to the garden to practise our fundamental movement skills. Lunch is provided and children who require a nap after lunch do so while others have a meditation time and educators intentionally extend ideas that have arisen from family interests. 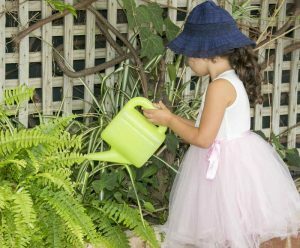 At 3:00 pm we have afternoon tea and children often choose to play outdoors under the trees. 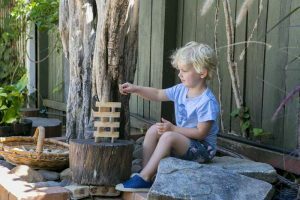 We rotate outdoor materials so that children have a variety of equipment to play with each day. At 4:00 pm, after a story or two, we use the under-awning section to offer quieter games and activities as we start winding down for the afternoon. All outdoor materials are packed away by 5:00 pm as we all transition inside to play quieter games and play until close.